Where the Pyramid Meets the Guy: Robert Anton Wilson is the subject of 'Maybe Logic.' 23 Skidoo! Who made you the pope of this dump? 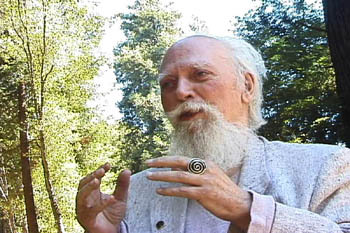 The answer is Robert Anton Wilson, futurist/satirist/skeptic/cracked old geezer. Wilson customarily empopes every attendee at his speeches with an official free imaginary triple-crown in his Discordian Church. "Eventually we'll make every man, woman and child on this planet a pope!" he vows. In Maybe Logic--shot in Live Oak and premiering July 23 at the Rio--the aged Wilson reminisces about his life (curious), his beliefs (blasphemous) and his health (bad but hopefully getting better). He's a post-polio case, soothed by Santa Cruz's endangered medical wackytoback; in part, the film's a plug for Vitamin M, including an interview with Valerie Corral of the Wo/Men's Alliance for Medical Marijuana. Wilson's motto "Every perception is a gamble" was tested 30 years ago to the day of the documentary's premiere. That date, as Wilson describes in his book The Cosmic Trigger, he was visited by a space-brother from Sirius, the Dog Star. In Maybe Logic, Wilson amends this momentous tale, saying that probably what came by for a chat was a "Pooka," a giant rabbit trickster spirit such as haunts the lore of Irishmen in County Kerry. Such creatures (Lupus Harveiius) are probably the species of the six-foot-tall purple rabbit who bedevils Elmer Fudd. More of the SC area's crystal-pinchers could use an application of Wilson's "Cosmic Shmuck Principle," the idea that doubt is better than certainty, and that recognition of the possibility of being a shmuck is the superhighway to freedom. Wilson's way, as described here (and more than once--this doc is on the repetitious side), is something like the motto on the medallion which the first humanist Montaigne wore: "Que sais-je"--"But whadda I know?" Maybe Logic features face-time with Tom Robbins, and Rev. Ivan Stang of the Church of the Subgenius. But the film isn't a sufficient introduction to Wilson. His satirical pulp is hardly touched upon in this doc, and why? His Illuminatus Trilogy was enlightening reading for this junior high school punk, who wasn't God-fearing so much as God-hating. How I and fellow knuckleheads loved Wilson's ripping yarn concerning several thinly disguised New Agers, Objectivists and other propeller-heads striving to blind the Eye in the Pyramid. Namely, the sight-hole of the Illuminatus: our secret bosses since before the French Revolution. The French Revolution--that was one of the secret org's misdeeds, some of which are outlined in rap group Foreign Legion's tune "Nowhere" ("They killed Kennedy, Big E., Tupac, and Abe Lincoln/ They planned the Titanic sinkin' ... They killed Versace/Cancelled Joanie Loves Chachi"). Risk the wrath of the Illuminated Order by attending the premiere, and there will be an appearance by Wilson. Go in a dope, come out a pope! Maybe Logic. Wednesday, July 23, at 8pm at the Rio Theatre, 1205 Soquel Ave., Santa Cruz. Tickets are $8 advance, $9 day of show, available at www.maybelogic.com. From the July 23-30, 2003 issue of Metro Santa Cruz.